I actually wanted to title this post Wah Fu -A journey into the unknown, or Wah Fu-An amazing discovery, except that it was not. Yes it was a discovery – but only for me, just like every other ‘outsider’ living in this area I have only trodden on the familiar paths and places. But yesterday a friend who lives in the same building happened to visit us and offered to take us for a ”surprise” walk. It was just kids and I at home who had nothing better to do and had had quite a boring Sunday, so we were all very excited to just get out – surprise or no surprise. The boys took their scooters as they usually do for long walks (read my other post about a morning walk with my son), but then while we were waiting in the lobby, the skies opened up and we had a short bout of heavy rain. We almost decided to cancel our plans but then after just 10 minutes, it cleared up and we decided to go for it, albeit not with the scooters as the brakes don’t function well on slopes and you can’t have a HK without slopes! So we started our walk on this nice walking pathway which is broad and tree-lined and where cars are not allowed. We continued to walk down the slope, the kids running way ahead of us making me feel glad that we did not hide in our house when it started to rain. 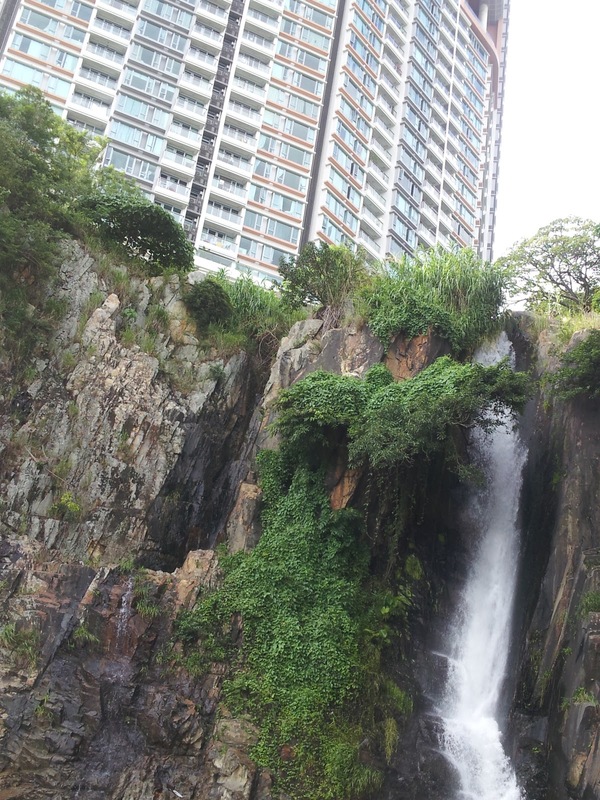 After a couple of minutes, we reached the lower part of Wah Fu, which houses the Wah Kwai Estate. 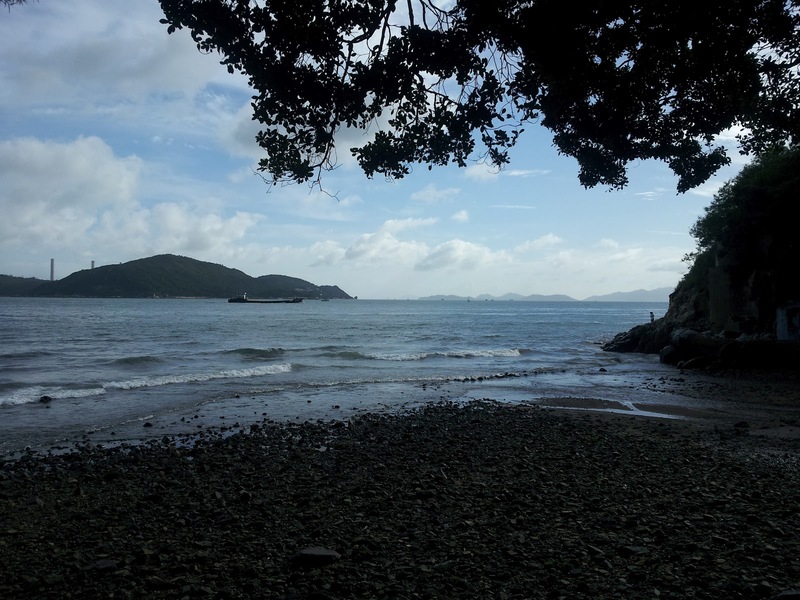 It was quite deserted, I guess the rains made everyone stay indoors, except the mosquitoes that were having a field day on our legs and by now in spite of the cloudy weather I started to feel the sticky heat of HK on my back and increased my pace, wondering how far the ”surprise” was. After leaving the housing complex, we started walking on a narrow ledge leading towards the sea and a few minutes away, we came across this sign that said ‘Danger: Do not swim or play at this seashore’. Just behind the sign we saw this young boy – not more than 10 years old swimming in the open sea with just a float on his waist! There were two or three other elderly people swimming out in the sea as well. This was no beach, just a rocky end to the sea and am sure quite dangerous as the strong waves could just crash you against the rocks….was this the surprise? 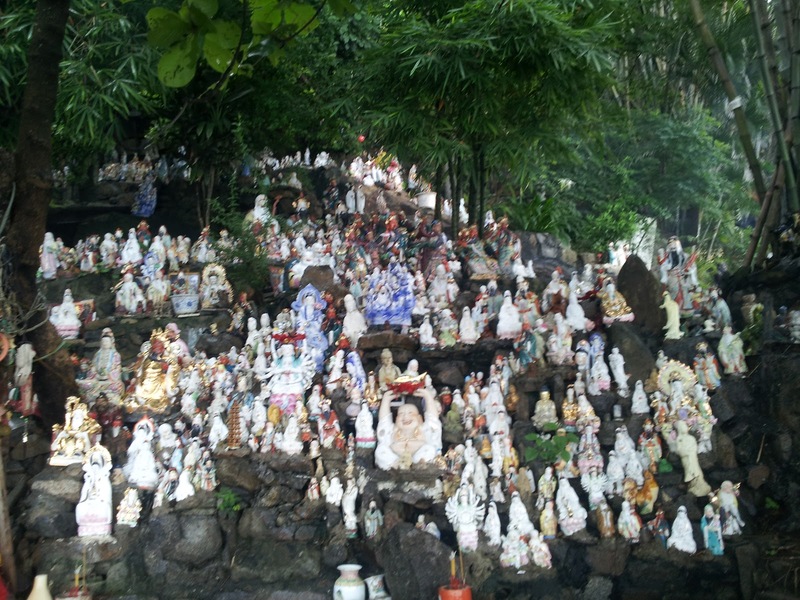 I was still wondering when barely a few footsteps away, my eyes fell upon rows and rows of idols of Chinese Gods and Goddesses all lining up the stone wall, the steps, under the trees, under bushes, wherever you look you could see these amazing idols resting or rather cemented in stone! There were agarbatti (incense sticks) stands under most of the idols. There was also a small mahjong parlour where some men were busy playing. 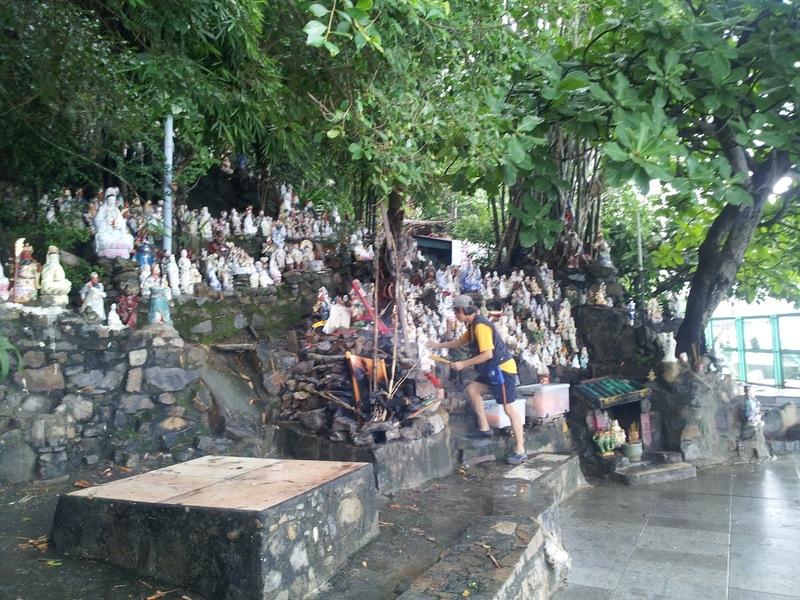 In fact when I went back to this place this morning to take some more photographs for the blog, I saw a man lighting up incense sticks and placing them under the idols. The scent of the burning agarbattis, the smoke and the sound of the waves crashing into the rocks gave this place a complete sense of serenity. It is very difficult for me to explain it in words….need to see it to believe it. I really liked my “surprise” and thought we would be heading back home but my friend said that there was more to see so we continued down the narrow path lined with steps in some places and just unevenly laid stones in others…it was a good thing I did not get the scooters. By this time my elder son was getting bored and wanted to just go back home, we kept urging him along and my friend kept telling him about a secret place she wanted him to see. I thought she was making it up at that time but just went along with it. We moved on from Wah Kwai to Wah Fu estate, passed a children’s playground, an elderly exercise ground, a group of middle-aged to elderly people doing Tai-chi (Chinese martial arts) till we came to a flight of steps going down. Here although I couldn’t see it I could hear the sound of a waterfall in the distance. “You are very close to your surprise”, said my friend. We had to jump over a gate to get closer. I thought we had already seen the surprise but I was totally unprepared for this sight. As we moved down the steps we finally reached a secluded beach or rather a small bay area with a waterfall flowing on one side (Waterfall Bay) and the sea on the other. The first sight of this hidden gem in an urban jungle took my breath away. The kids immediately started running down the last few steps eager to reach the waterfall, as if they suddenly had a burst of renewed energy pumped up their system! I walked down slowly taking in the beauty of my surroundings and still amazed by the fact that it existed in my neighbourhood. I looked up at the mouth of the waterfall….it seemed like it came from nowhere but to its left, right above stood the Bel Air housing complex. This is one of the very “up-market” and stylish complexes of Southside HK built in great splendour and style, very high not only on its security standards but also on its rules and regulations. We had considered living there before we saw our present apartment. But now as I stood at its base, with this majestic waterfall on my right flowing into the deep blue sea, it made me realise how insignificant and meaningless man-made developments are compared to the power and the beauty of nature. I kept standing there totally humbled when my friend showed me something else which was the best surprise of all. On the other side facing the sea, there was a little makeshift ‘mandir’ (Hindu temple) with a Shiv ling (Lord Shiva sign) installed and a Ganapati (Elephant God) idol! There were two tiny bells hanging in the branch of a tree above and the fragrance of burning agarbattis filled the air. Apparently this mandir has been here since a long time and there are a few Hindu Indians who come here often to pray and to maintain the place. I said a quick thank you to God for blessing us all with a good healthy life, we took a few photographs, collected some shells and then we proceeded towards our long walk home, kids running in the front, suitably re-charged. 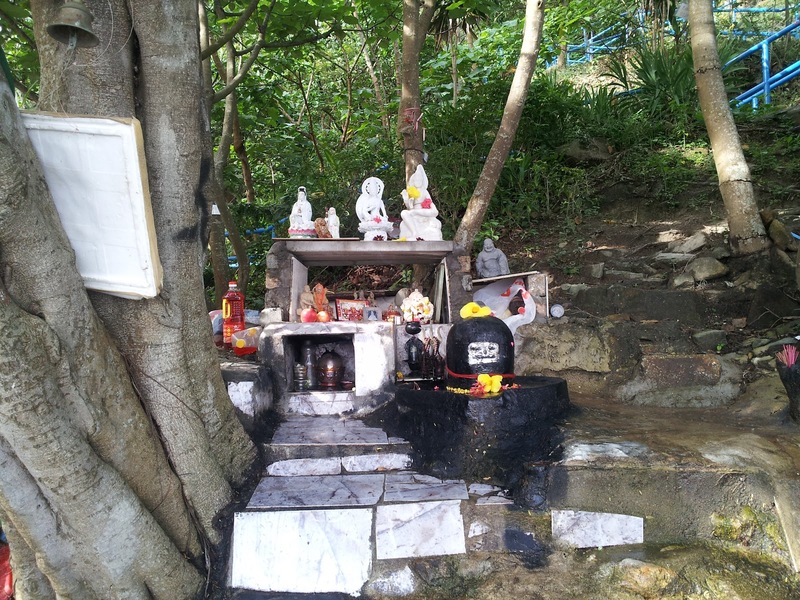 I looked up the internet to get more answers to these mysteries:—Wah Kwai site used to be a cemetery before the year 1967 before land was reclaimed, this could explain the presence of the Gods idols all lined up near the sea- as if asking for forgiveness from the dear departed. 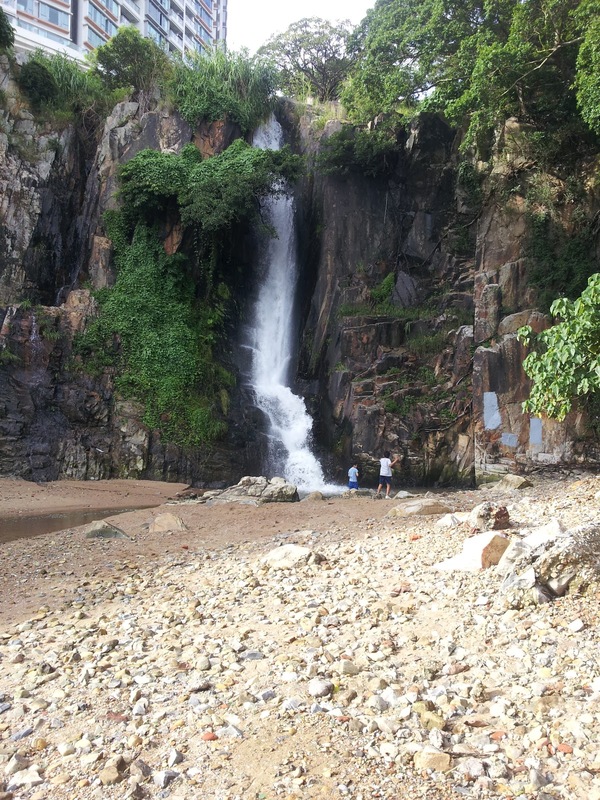 — It is long believed that the waterfall attracted British ships coming to HK to fetch fresh water after a long journey. This water was so sweet that the harbour it flowed into also became sweet giving rise to the name ‘hong kong’ meaning ”fragrant harbour”. This post was featured on The HK Hub http://thehkhub.com/i-live-here/explore/local-surprises/ under the Local Surprises section on March 04, 2013. I don't have words today to praise your post. The way you have narrated I am speechless. can't say much but will say that this post was excellent by all standards. WOW, what a wonderful comment! Thank you! I know you write about travel and treks, so coming from you this comment means a lot. Do keep visiting my site whenever you can. How beautiful mehroo. So much to learn om your blog. Thank you Jahnavi. So happy to know that you are following it! Beautifully described Mehroo! We have been going there for the past 3 to 4 years on Shivaratri to perform a little puja with a group of friends. It is absolutely breathtaking! Thank you Ritoo. Yes I had heard that from my friend Geetanjali who first took me there. Hope you find other interesting things on my blog!